Unified Modeling Language (UML) is a visual modeling language in the field of software engineering. It is an open standard that provides the graphic notations for creating the visual models of object-oriented software systems. UML took in the notations of the Object-modeling technique, Object-oriented software engineering and the Booch method. UML is widely used by software engineers, software developers and software designers, i.e. by those specialists who need to create the detailed software documentation, to specify the life cycle of the software development. There are two types of diagrams used in UML: Structure Diagrams and Behavior Diagrams. The Rapid UML Solution for ConceptDraw DIAGRAM presents the intuitive RapidDraw interface that helps you to make the UML Diagram of any of these 13 types quick and easy. The Rapid UML Solution for ConceptDraw DIAGRAM provides templates and samples for each type of UML diagram that help you to create the UML Diagrams in one moment. 13 libraries of the Rapid UML Solution of ConceptDraw DIAGRAM make your UML diagramming simple, efficient, and effective. You can simply and quickly drop the ready-to-use objects from libraries into your document to create the UML Diagram. The documents of ConceptDraw DIAGRAM with UML Diagrams are vector graphic documents. They are available for reviewing, modifying or converting to a variety of formats: image, HTML, PDF file, MS PowerPoint Presentation, Adobe Flash or MS Visio. ConceptDraw DIAGRAM extended with the Rapid UML solution is perfect for drawing professional looking UML diagrams. ConceptDraw DIAGRAM v12 is a powerful diagramming and vector drawing software. Extended with Chemical and Process Engineering Solution from the Engineering Area of ConceptDraw Solution Park, it became the best Chemical Engineering software. Use Case Diagram Taxi Service UML. This sample was created in ConceptDraw DIAGRAM v12 diagramming and vector drawing software using the UML Use Case Diagram library of the Rapid UML Solution from the Software Development area of ConceptDraw Solution Park. This sample shows the work of the taxi service and is used by taxi stations, by airports, in the tourism field and delivery service. The UML Diagrams are widely used by software developers and software engineers. They can draw the UML Diagrams manually on the paper, but it is incredibly convenient to use the special UML diagramming software. 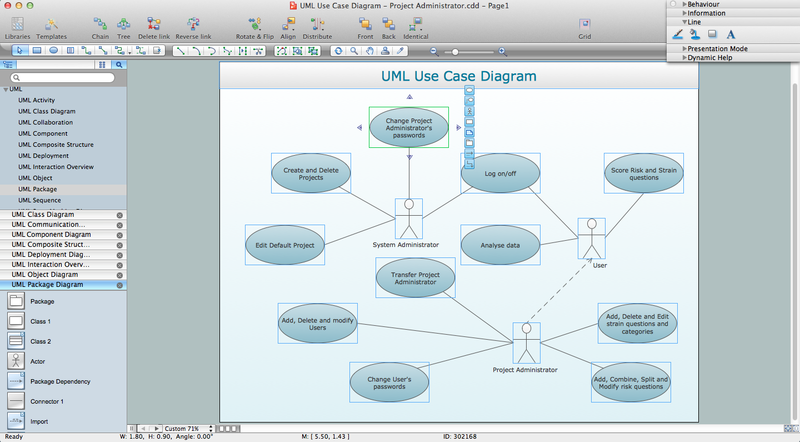 The UML diagramming software allows you to draw the UML Diagrams in a few minutes. Unified Modeling Language (UML) is a language of graphic description for object modeling in the field of software engineering. UML was created for definition, visualization, designing of software systems. UML is an open standard that uses graphic notations for creating visual models of object-oriented software systems. The Rapid UML Solution for ConceptDraw DIAGRAM v12 presentsthe intuitive RapidDraw interface that helps you to make the UML Diagram of any of these 13 types quick and easy. This example shows the OOSE method. It was created in ConceptDraw DIAGRAM v12 diagramming and vector drawing software using the Rapid UML Solution from the Software Development area of ConceptDraw Solution Park. This sample shows the OOSE diagram with aggregation and composition associations. Using the Rapid UML Solution for ConceptDraw DIAGRAM v12 you can create your own professional OOSE Diagrams quick and easy.